Pajarito Environmental Education Center – Enriching people’s lives by strengthening their connections to our canyons, mesas, mountains, and skies. Join PEEC and Jean Dewart of the Los Alamos Mountaineers to celebrate the Fall Equinox with a potluck social dinner and a night hike on Sunday, September 23. The potluck dinner will be held at the Los Alamos Nature Center at 5 p.m. in the classroom. Bring a dish to share with the group. The nature center will provide water, cups, plates, and utensils. After eating dinner and enjoying the company of fellow hikers, the group will carpool to the trailhead at about 6 p.m. The group will hike on Cañada Bonita trail from the Pajarito Mountain Ski Area. The hike will be about 2 miles, roundtrip. The group plans to return to the nature center by about 8:30 p.m. Hikers should dress appropriately for the weather. Wear layers and bring a hat and gloves. All hikers should also have a headlamp or flashlight. Registration is required for this outing. Space is limited to 40 people, so reserve your place soon! Jean Dewart is an avid Los Alamos skier, kayaker, and hiker. 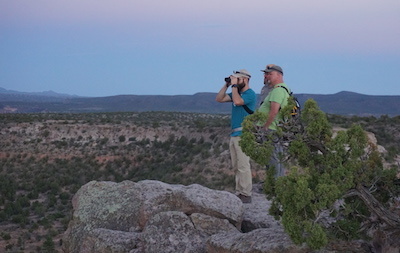 Photo by Beth Cortright of our spring evening hike to Tsankawi Ruins. Admission: $8/family and $4/person for PEEC and Los Alamos Mountaineer members, $10/family and $5/person for non-members.